Stephen Hawking says that Black Holes need to be redefined. The notion of an 'event horizon', from which nothing can escape, is incompatible with quantum theory. I've read that quite a few physicists aren't buying it. But don't quote me on that. Seems they might be updating that videos you posted, happens a lot. Like chasing a serpent. General Relativity says that passing through the event horizon of a black hole is no different than passing through any other spot in normal space. The traveler would not know that they have crossed the point of no return. Quantum Mechanics says that passing through an event horizon is like hitting a "firewall." All the constituent components that make up the traveler are broken down into a quark-gluon plasma at the event horizon. Furthermore, General Relativity suggests that information is lost through the singularity. That defies the law of conservation of energy. Both theories cannot be correct. Hawking provides a third alternative. That there is no singularity, and that there is a difference between the event horizon and the apparent horizon. If the event horizon is larger than the apparent horizon, then it appears as a black hole. However, if the apparent horizon is larger than the event horizon, then the black hole appears extremely bright and extremely hot as it emits Hawking radiation. In either case, no information is lost according to Hawking. All the information the black hole consumed will eventually be released, just not in the form it went in, through Hawking radiation. This process will take trillions of years. Wouldn't it be easy to verify the theory? If the black hole is blasting energy, we should be able to see it. The problem with Hawking's theory is that no one has ever measured/detected Hawking radiation. We have, however, detected lots of radiation emanating from black holes. For instance, Cygnus X-1 is stellar black hole, and is one of the brightest x-ray sources in the galaxy. 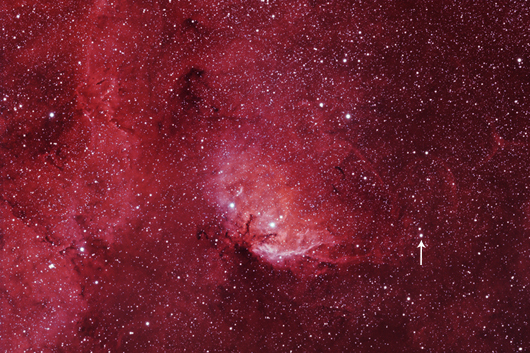 Arrow points to the location of Cygnus X-1. That is true. Nobody has detected Hawking radiation. It is entirely theoretical based upon quantum mechanics and the Heisenberg Uncertainty Principle. The radiation being detected from Cygnus X-1 and other black holes is completely different from Hawking radiation. Outside of the event horizon of many black holes is an accretion disc. In the case of Cygnus X-1, its accretion disc is formed by siphoning off the outer layers of its companion star HDE 226868. A rapidly rotating black hole with a strong magnetic field will cause the particles in its accretion disc to become ionized and eject those particles in the form of jets emanating from the poles (the weakest magnetic point) of the black hole. Keep in mind that unlike Hawking radiation, these strong x-ray and gamma-ray jets that are found with many black holes are not actually coming from inside the black hole, but rather from just outside of its event horizon. Obviously, anything that crosses the event horizon of a black hole is not going to be able to ever come back out again, except in the form of Hawking radiation. Not really. All the black holes that are blasting energy that we have observed thus far are blasting energy due to the material in the black hole accretion disc and the strong magnetic field of the black hole. The x-ray and gamma-ray jets coming from the poles of the black hole is not really coming from the black hole itself (since nothing can escape its gravity), but rather from the material in the black hole's accretion disc just outside of the event horizon of the black hole.